There’s nothing better after a day at the beach than a light pasta dish with a scrumptious seafood sauce. I suppose, because I’m part Irish, a day at the beach is usually short for me because I fry and freckle like a red-headed step-child. l like the beach; actually, I love the beach. But, after tanning in oil and iodine many years ago, my skin doesn’t want that UV radiation anymore. So, I’m out of the sun business. BTW. Did you know that the majority of women’s skin cancer’s were found on their lower legs? Don’t quote me on this, but I believe it. You sit, head in the shade, legs exposed… bam. Anyway, I digress. I travel extensively through my friends’ Facebook travel photos. Personally, I’ve only seen a few countries, but I have been around the world on Facebook. I always ask,”What did you eat? “What did you order? What was on the menu?” So today, apparently I was in Bali or Anguilla. Seeing that turquoise water and white coast made me think of shrimp. When your in a vacation mind-set, nothing will substitute. I knew I did not want shrimp smothered in lemon or dill. How boring… So I made a wine sauce with a few secret ingredients and it was the bomb. I mean really good, ya’ll. Fresh gulf shrimp and mushrooms take on the flavors of the seafood sauce which entails white wine and a few other ingredients. The beauty of this dish is that the sauce can be prepared in advance; reheated and poured over any pasta. Serve with a salad and call it dinner! Shrimp is a low calorie shellfish that is full of protein. It provides a small amount of Omega 3’s-those EFA;s (Essential Fatty Acids) we need for our brain and overall homeostasis. Yes, shrimp is high in cholesterol, but studies have shown that consuming foods high in cholesterol, in a moderate fashion, is okay. You’re not going to get high cholesterol if you eat a shrimp dinner. Or an egg. Consuming cholesterol is different than producing it within your body. There are marine-certified fishermen out there catching farmed and wild fish. Farmed fish are in huge nets in the sea, or in special holding tanks that might even be off-shore. Some farming of fish is legitimate and clean. Some isn’t. Wild, or wild caught seafood is just that. It has not been monitored, nor fed by man. 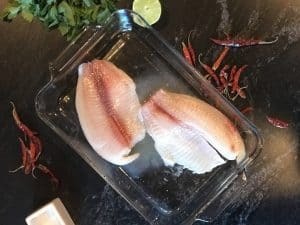 The best way to determine whether your farmed fish is farmed “safely” is to contact the folks at NOAA-National Oceanic and Atmospheric Administration. This quick and easy seafood sauce goes along way; I use butter, shallots, mushrooms, a bit of oil, wine and a cornstarch slurry to thicken it. If you prefer, you can omit the cornstarch slurry for the seafood sauce. You can make this ahead and refrigerate it up to three days. A light buttery wine sauce perfect with seafood! You might want to try this sauce when you make the Shrimp and Crab Beggar’s Purse!